Chronic bullying has a negative impact on students’ academic performance, according to new research published online January 30 in the American Psychological Association’s Journal of Educational Psychology. The study, “Peer Victimization Trajectories From Kindergarten Through High School: Differential Pathways for Children’s School Engagement and Achievement?” by Gary W Ladd, Idean Ettekal, and Becky Kochenderfer-Ladd at Arizona State University, tracked 383 students from kindergarten in Illinois public schools through high school across 24 states. It concludes, based on self-reported surveys, teacher reports, and standardized test scores in reading and math, that young children who are bullied for years, or teens who face increased bullying in high school, lack confidence in their academic abilities, get lower grades, and dislike school more than their peers. “It’s extremely disturbing how many children felt bullied at school,” said Mr Ladd, a psychology professor at ASU and the study’s lead author. “For teachers and parents, it’s important to know that victimization tends to decline as kids get older, but some children never stop suffering from bullying during their school years,” he added. Researchers say 24 percent of the students faced chronic bullying, and 18 percent faced some bullying early in grade school that got worse in high school. In both of these groups, boys were more likely than girls to have been bullied. Kids can escape bullying. Bullying eventually stopped for 26 percent of students who were bullied early on in the study; their academics were not as affected, and their performance results were similar to the 32 percent of students who faced little or no bullying. This suggests that many children who are victims of bullying can recover, the researchers said. “That’s a very hopeful message,” Mr Ladd said. But “frequently, kids who are being victimized or abused by other kids don’t want to talk about it. I worry most about sensitive kids who are not being taken seriously and who suffer in silence,” he said in a news release from the American Psychological Association. The US Department of Education has an up-to-date list of bullying resources for school officials who may want to make sure they have the most current information, but the best source for students is what they have close to home—in their schools and in their classrooms. The Social Studies Department at Normal Community High School, near the campus of Illinois State University, recently launched a student project that can raise awareness about important social issues like bullying. A few students there took on projects to underscore how bullying can lead to suicide and note that suicide is one of the biggest killers of US teens. With the permission of the faculty advisor, we reprint a story from the school’s student newspaper, The Inkspot, that ran on January 20. “It represents a sentence the author could have ended, but chose not to. 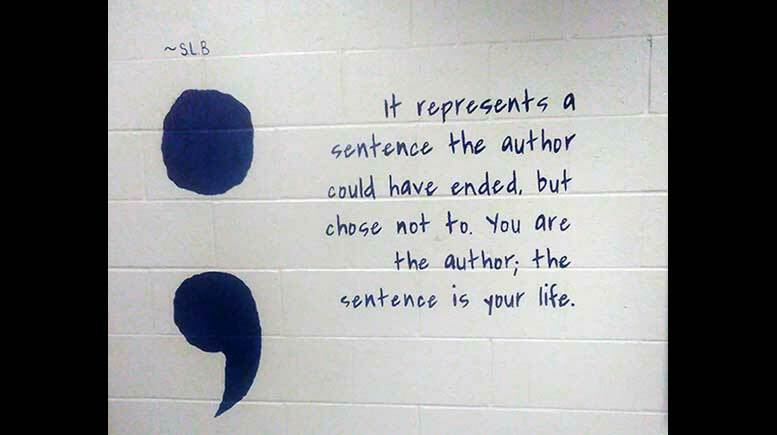 You are the author; the sentence is your life.” ~S.L.B. Making an impact while earning a grade, Sophia Baietto painted that mural, metaphorically explaining suicide, in Misty Morris-Lelm’s classroom. Social studies teacher LaTishia Baker decided this year that she would also participate in the “20% Project” assignment that her departmental co-worker Stefen Robinson started a few years ago. The project is an assignment in which students find a passion project with a community impact and spend 20 percent of their class time on that work. The students choose a subject important to them and participate in social justice work. To Mr Robinson, the idea of making a student sit at a desk and listen as someone talked at them about a time when a person worked on something that they were passionate about, seemed like stunting the growth mentally for the students. “I want to offer the opportunity for students to get involved in activism,” he said. In place of hearing him lecture about an activist—something almost abstract to some students—Mr Robinson wanted them to actually practice activism, community change. His main goal in starting the 20% Project was to get students to work for something that they enjoy or find interesting. Why not let them do something they are passionate about now, instead of waiting until their 12 years of school is over to get a diploma to tell the world they’re now allowed to do what they love? McLean County coroner Kathy Davis stated in an interview with the Pantagraph that the county had 16 suicides in 2014. Just last year, however, that number rose to 21. Those numbers may seem small to some, but McLean County’s population of 169,572 people, spread across the land of 1,186 square miles, makes those deaths have a big impact on communities. “We need to do more than talk about it,” Mr Robinson said. That is just what two girls in Ms Baker’s class would do. More teenagers and young adults die from suicide than from cancer, heart disease, AIDS, birth defects, stroke, pneumonia, influenza, and chronic lung disease, combined. Also, every year, 864,950 people attempt suicide, which means 1 person attempts suicide every 38 seconds. More people die by suicide than by homicide in the United States, according to the Jason Foundation, a nonprofit dedicated to the prevention of youth suicide. Only accidents cause more deaths to middle and high school age youth than suicide. Senior Kennedy Savage and another student, Nikki Leese, used the topic of suicide for their 20% Project: the words ‘Suicide Awareness’ were stamped across a blue silicone rubber wristband. The severity of serious topics such as suicide doesn’t always register with students until it occurs or affects them directly. Suicide is a great example of this. Serious topics often don’t matter until they matter too much, until they hit too close to home. A 15-year-old NCHS sophomore, E.M.S., committed suicide on August 23, 2015. Her death affected many people in many different communities: her softball teammates, her middle school classmates spread throughout Unit 5 and other school districts. She was a loving daughter, sibling, friend, student, and teammate to many. E.M.S. “was a close friend of ours, so it was very personal to us and we just kinda took it and ran with it,” Kennedy said. She and Nikki went and sold the wristbands for $1 and raised over $150. The wristbands were sold inside and outside of NCHS until the students were sold out of their supply. The money raised was donated to the American Foundation for Suicide Prevention. Suicide awareness posters have emerged on hallway walls and suicide prevention phone numbers have been posted in bathrooms with pull tabs, but the conversation needs to continue—louder and more often. The blue ink standing out on the otherwise blank white wall, the blue rubber against the wrist of high school students—these grab attention. But the number of deaths by suicide is larger than anyone wants it to be, larger than it needs to be. If you are having an issue in the NCHS community or just have the need to express yourself, please contact a school counselor, the National Suicide Prevention Lifeline at 1-800-273-8255, or the school’s Anti-bullying Hotline at (309) 285-8912.